Fields Landing is a secured boatyard with a variety of storage options, particularly small boat storage. Located at the south end of the community of Fields Landing in the Humboldt Bay, south bay area, the yard offers easy access to the Bay’s Pacific Ocean entrance and to Highway 101. Owned and operated by Humboldt Bay Harbor, Recreation and Conservation District, Fields Landing Boat Yard is a do-it yourself yard open seven days a week, 365 days a year. Open air storage can accommodate boats up to 100 feet in length. Vessels may be hauled out of the water and moved via the mobile boat lifting hoist (150 ton capacity). 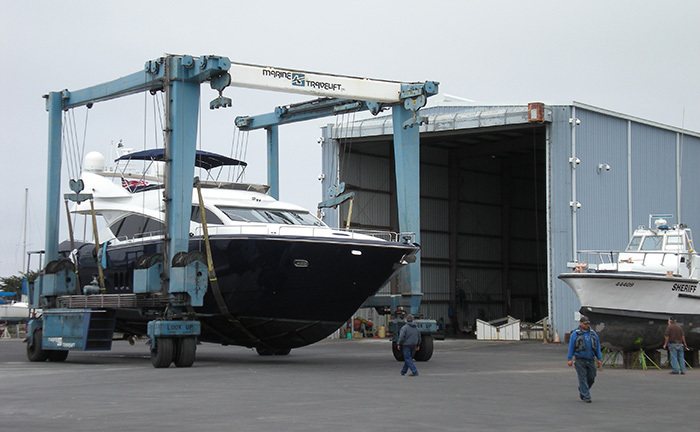 An indoor facility is available for boat repair and can accommodate vessels up to 80 feet in length. Repair and maintenance stores are available for purchase onsite. This secure facility is fenced and has 24-hour surveillance. The District’s bay dredge is also housed here. As environmental stewards, the Harbor District has recently implemented a zero discharge boat washing recovery system. This ensures no water from boats runs off directly into the Bay. Additionally, the District manages approximately 20 acres of land next to the boat yard. This sanctuary offers beautiful bay views, a walking trail and bird watching/wildlife viewing opportunities.